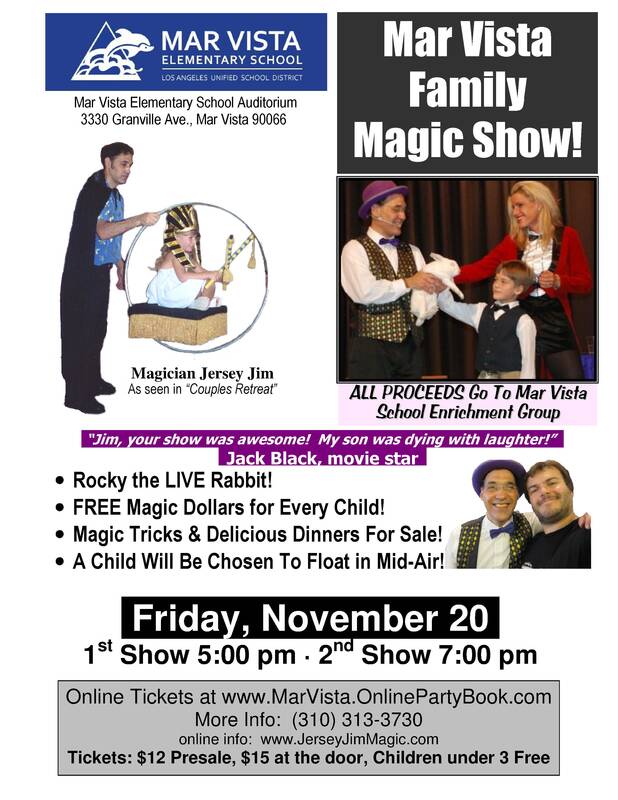 Jersey Jim is bringing his FunTastic Family Magic Show Fundraising program to Mar Vista Elementary School on Friday, November 20, 2015. There will be two shows at 5 pm and again at 7 pm. What can attendees expect? 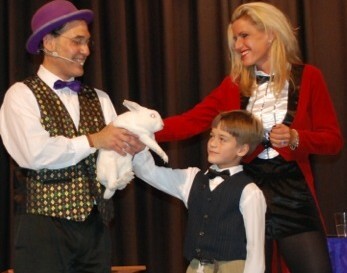 The FunTastic Family magic show is the same show that Jersey Jim performs at professional theaters. It features 90 minutes of unique entertainment complete with music, beautiful props, and Jim’s hilarious blend of comedy, audience participation, and grand illusion, including sawing art teacher Mr. Miceli in half with a power buzz saw! Jim is quick to reassure that all ages will be laughing at this comedy routine. This entry was posted in School Fundraising Magic Show on February 12, 2019 by Jim. As a professional children’s entertainer I get to see to what extraordinary lengths mothers and fathers go to in order to make their children feel special about themselves by hosting wonderful birthday parties for their little ones. Putting on any birthday party is a wonderful gift and a huge job for any parent to give to their child. However, there are some parents that set the bar really high. I recently entertained for a lucky little boy whose parents put together an amazing Harry Potter-themed birthday party. 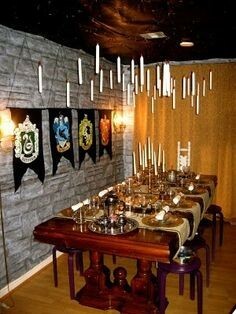 They had changed their backyard into the dining hall at Hogwarts with a great deal of ingenuity and work all of which was fueled by their delight at knowing how much their son would enjoy it. They had made floating candles out of battery powered candles which were glued onto toilet paper rolls, which were painted white. They even used hot glue to make wax dripping down the sides of the candle and fishing line made the candles float! The dad even got dry ice so that the cauldrons would boil and bubble. $4,432.25 For Another Elementary School! 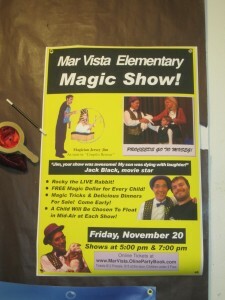 Last Friday, Mar Vista Elementary hosted Jersey Jim’s FunTastic Family Fundraising Illusion Show. They choose to have two shows, one at 5 pm and one at 7 pm. Their auditorium was packed. Everyone had a great time, especially the kids (though the adults laughed just as much). 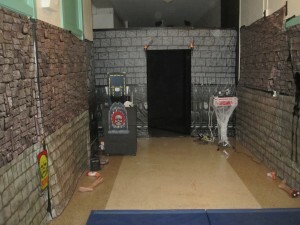 Best of all, the school raised a total of $4,576.25 in one evening of family fun with minimal prep time. 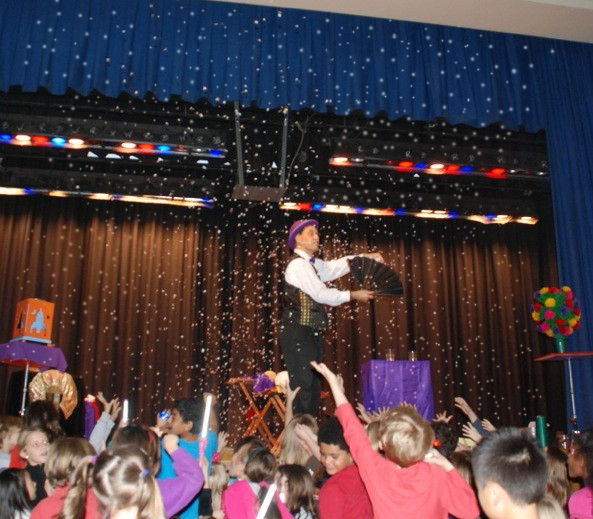 Jim’s Comedy Magic Show Fundraiser for schools is the easiest fundraiser your school will ever hold and the results speak for themselves: great family entertainment which raises lots of free money for the school. I say “free money” because those entertainment dollars would be otherwise going to a movie or some other corporate profit-making entertainment. 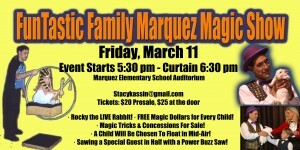 Why not let your school reap the benefits while hosting a one-of-a-kind, live Las Vegas-scale illusion show that will give your population a unique experience that can be enjoyed as a family. First of all Jim, thank you for the great shows and helping us raise the money for MVSEG! Thank you Uttara and Jennifer for all of your work on this. Unpaid Ticket Sales: $144 ( I am working on collecting and making sure they did not pay at the event). 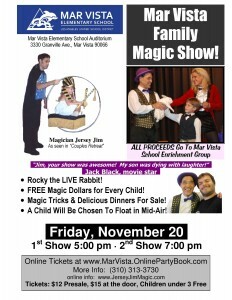 This entry was posted in School Fundraising Magic Show on December 2, 2015 by Jim. 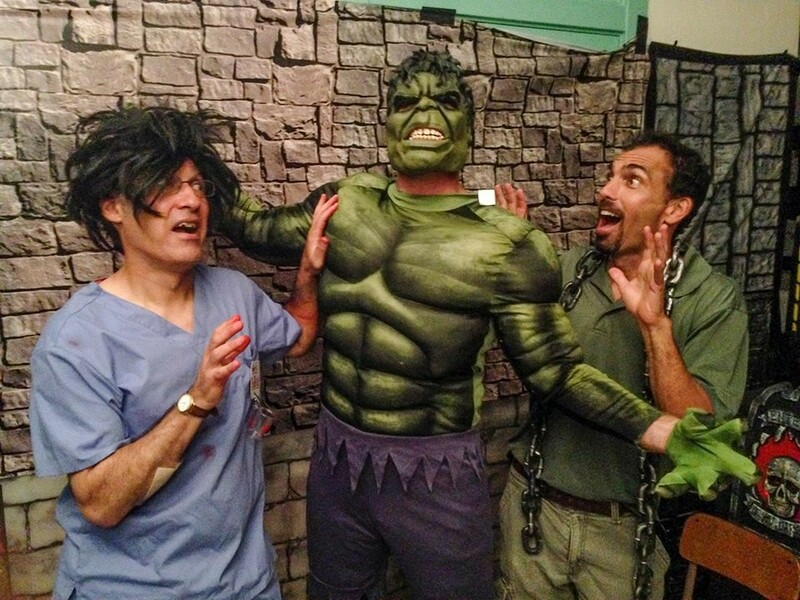 This Halloween season, Jersey Jim brought Halloween fun and scares to a Los Angeles Elementary school and helped raise thousands of dollars for the school at the same time. Jersey Jim also contributed another original illusion he created which turned the school’s principal into a living skeleton as pictured below! The school raised thousands of dollars while having terrific Halloween spooky-goofy fun thanks to the illusions and Halloween themed magic shows of Jersey Jim! Schools typically raise from $2,000 to $12,000 in a single night with hardly any work while giving their families a terrific community family event. 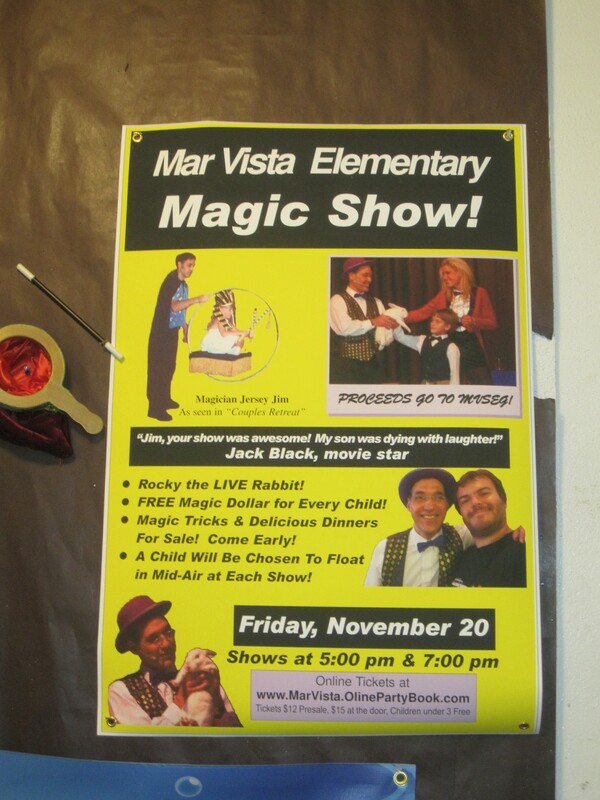 This entry was posted in School Fundraising Magic Show on October 27, 2015 by Jim. You may notice that the url–the website–on the business card is a different web address than perhaps you are used to seeing for Jersey Jim. 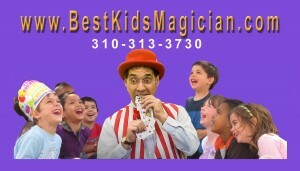 This is the web address that takes you directly to my webpage for my children show business. Although I offer all kinds of magic shows–I offer magic for adult audiences, I offer Library shows that are educational and themed for each year’s summer reading them, I offer a 90 minute school fundraising show which rivals what you would see in Las Vegas–but Jersey Jim’s start in magic was performing for children at preschools and at private birthday shows. Jim gives every child one of his famous magic dollar bills at every public and private magic show, however, I have noticed that children also enjoy receiving a business card as well. Perhaps kids like getting business cards like grown ups! 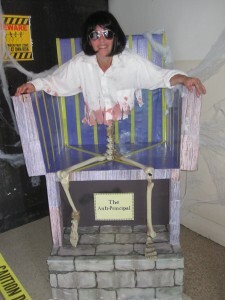 This entry was posted in School Fundraising Magic Show on August 5, 2015 by Jim. Had a great theater show last night with two beautiful assistants. Here we are backstage 5 minutes before curtain. Say hello to Cyndi and Jennifer. Nice work if you can get it! 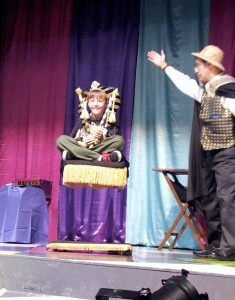 Some days it pays to be a magician! This entry was posted in School Fundraising Magic Show on November 17, 2013 by Jim.